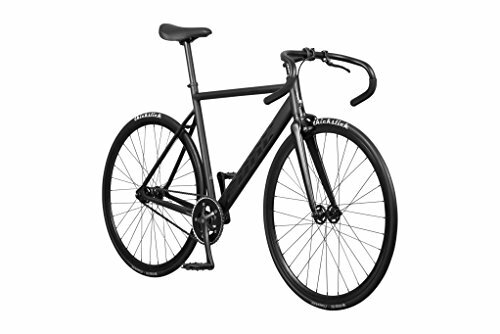 Designed to accomplish on the streets, the velodrome, and in every single place in between, the reasonably priced, lightweight Keirin Complete Track Bike with double-butted 6061 aluminum frame is able to race. Pure Cycles offers two complete track bike options with aluminum tubing — the Keirin (double-butted) and Keirin Pro (triple-butted) – which can be engineered for speed with race-tested geometry and most sensible-tier components. The Keirin frame with double-butted 6061 aluminum tubing is designed to provide the edge on the track and the streets. Featuring an integrated headset and smooth welds, it’s light, stiff, responsive, and able for anything else from a criterium to a go back and forth. Designed for the drome and hard enough for the streets, this track bike features an aluminum fork with aluminum steerer to assist cut back road vibrations, alloy drop bars with both track grips and handlebar tape, Pure Fix Drome 2 saddle, a 46 x 16 gear ratio, Pure Fix 30mm Deep Dish 32-hole rims with alloy flip-flop hubs, and WTB Thickslick tires (700 x 25C). It is usually integrated chain tensioners and headset, sealed bottom bracket, tapered head tube, 31.8mm seatpost clamp, and a 68mm English threaded bottom bracket. Aluminum bike frames will have double-butted and triple-butted tubes that experience different thicknesses, allowing the frame to maintain high-stress points on the end of the tubes with no need additional weight during the middle. Double-butted frames add extra subject matter at each and every end of the tube where additional strength is needed. Triple-butted frames use the similar process, but reduces weight within the center much more. Celebrating bicycling for all that it offers, Pure Cycles offers a lot of frame, geometry, and gearing options in addition to a cornucopia of compatible accessories, including different styles of handlebars, saddles, water bottle cages, foot straps, and more.